I love roasted vegetables, roasting the vegetables brings out such great flavors. 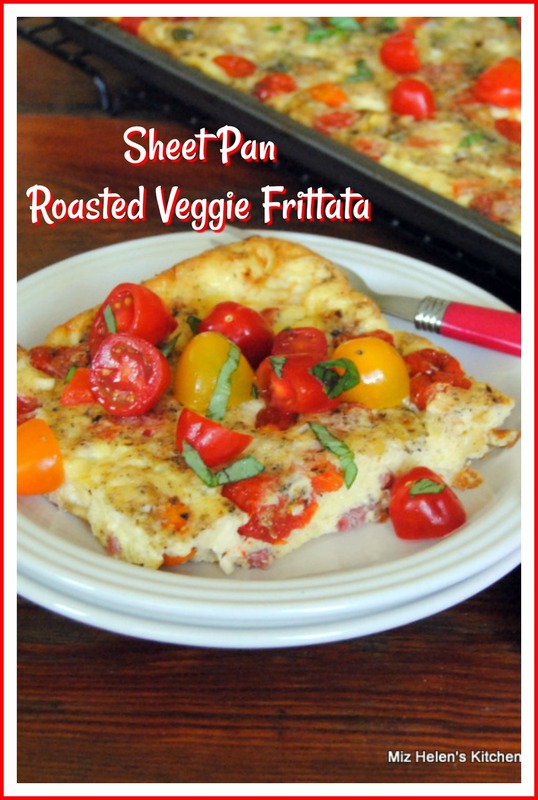 This Frittata is a simple blend of roasted vegetables with herbs and ham. We are making it on a sheet pan that keeps it real simple and informal. We have found this to be so convenient for feeding a brunch crowd and a wonderful way to cook for the freezer. We have recently used this recipe to feed a very large crowd for brunch and the folks really loved it. At the cottage we make the recipe and enjoy it for brunch then take the rest and freeze it in serving sizes for the freezer. It is a great grab n go for a busy life style and who doesn't have a day like that from time to time. The combination of vegetables and herbs makes this a delicious brunch dish that I hope you enjoy as much as we have. In a large mixing bowl, place 3-1/2 cups cherry tomatoes,green onions,green and red bell pepper, dried basil, dried oregano, salt, black pepper, cayenne pepper and 2 tablespoons of the olive oil. Toss all of these ingredients together and let stand at room temperature for 15 to 20 minutes. Pour the remaining 2 tablespoons of olive oil to the sheet pan and place the veggies evenly on the sheet pan. Roast in the oven at 400 degrees for 15 to 20 minutes. Remove the roasted vegetables to a cooling rack. In a large mixing pitcher, beat the eggs, add the half and half, Feta Cheese and cubed ham. Pour the egg mixture over the roasted vegetables and bake in the oven at 375 degrees for 25 to 30 minutes until a soft set in the center. Remove from the oven and garnish with the remainder of the tomatoes and fresh basil. Individual servings will freeze well for up to six weeks. I am so happy that you could come over to the cottage for brunch today to enjoy this delicious Sheet Pan Roasted Veggie Frittata. We always have room for one more at our table and today we are happy it is you! Hope you have a great week and come back to see us real soon! I'd be so happy to come to your delicious brunch and taste this frittata, Miz Helen! What a perfect way to feed a crowd in your country kitchen. What a great idea!! Saving this to use this summer when the tomatoes are ripening! Thanks for sharing at the What's for Dinner party. Have a great week. Looks so colorful and yummy! It looks like it can feed an army, too. Perfect for when we have family over or to just stash in the fridge for busy mornings. Thank you.